The 10′ x 6′ Windsor All-Purpose Pent Shed offers a fantastic and classy look in addition to plenty of storage space to make sure none of your belongings need to be left outside in the rain or be inside cluttering up the house. 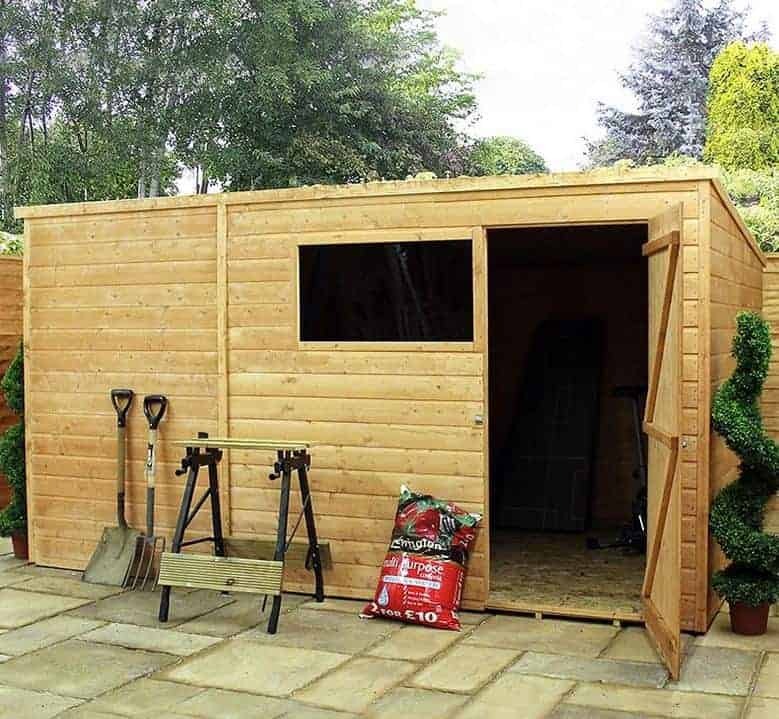 With lots of room inside to organise your things, this is a shed which is going to be able to keep safe many of your items such as gardening equipment, tools or if you are a family, the kids outside toys and bikes. While being a structure that is very practical it is also going to look great as its stands tall in your garden. 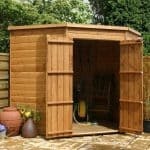 No matter the style or shape of your garden this shed will effortlessly blend in and provide you with years of service. 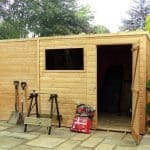 Clearly this is a very attractive shed which has a very modern look, but this is actually also a shed which has been made from some very high quality materials to ensure you have a shed which is going to protect your items for a very long time. The tongue and groove shiplap cladding allows no water inside as does the pent roof. Inside there are some strong roof and floor boards which along with a sturdy frame make this one very robust building. 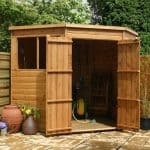 Offering a large storage space and a very modern and appealing style, the 10′ x 6′ Windsor All-Purpose Pent Shed is a structure that will instantly make any garden it is in better. Here we have a shed where most of the room inside is in its width, you have 9 feet 10 inches of width and even from the outside, you can tell there is a whole lot of room inside here. The depth of the shed is also pretty impressive at 5 feet 11 inches. After construction, you will be very pleased with all that empty space facing you. The height of the shed at the front is 6 feet 5 inches which we feel is plenty of headroom to make spending time in here comfortable. At the back of the shed though because of the pent roof design the height does drop to 5 feet 5 inches. Not a huge deal, but it is something that you have to consider when you are planning how you are going to store things. The pent roof which Windsor have used on here will do an incredible job at keeping the water out. The roof actually slopes towards the back so if you are outside in the rain and trying to get in, the water will not be running off onto you. The roof is made with solid sheet boarding which is 8 mm thick. On top of this we have some very high quality roofing felt which will protect the boards for many years. From the picture, you can clearly tell that the tongue and groove shiplap cladding which is used is just gorgeous. Windsor really have done an amazing job here and if you think it looks nice in pictures just wait until you see it standing in front of you. 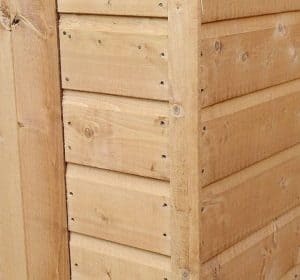 This style of cladding makes the shed water proof and offers the rain no little areas that it can sneak inside and ruin your belongings. At 12 mm thick, the cladding is also rather robust and will be able to take a little bit of abuse over the years. If you have children playing in the garden then this is great as we all know kids love to kick balls and other things off a shed. 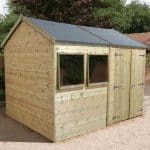 Considering the shed is under £500 it is actually rather strong and that is because of the top quality cladding and the 28 mm X 28 mm frame that is inside the shed. 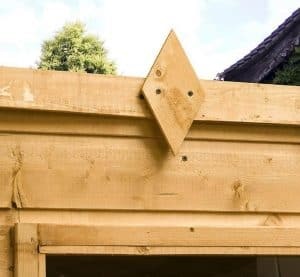 This is a style of frame which we have seen Windsor use a few times now and the high quality of the wood ensures that it is going to last many years and give your shed plenty of strength so that it does not feel weak, flimsy or cheap. We are very happy with this frame and feel that it is going to make the shed be something you can use for a long time. The floor is something that did impress us immensely. To start with the floorboards are that same kind of solid sheet boarding which has been used for the roof. Here though they are just a little bit thicker at 10 mm. This added thickness will allow you to store many heavy things inside here and also walk around without feeling like the floor could give out. While the actual boards are very solid and strong the pressure treated floor joists are a huge part of what makes things so strong. So do not worry about the quality of the floor as this could happily take the weight of a steel safe filled with gold bars, if you are lucky enough to have one of course. All of the wood will be dip treated before it is delivered to you. 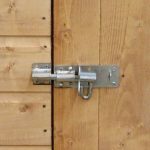 This though is to protect the shed in transit and not supposed to protect it in the long run. Once built, you will need to treat the shed. Doing it as soon as you have built it is something we always recommend as it gets it out of the way and will let you see that doing this is really not that hard or too much of an inconvenience. To ensure a long lasting shed, treatment should be done once a year. The shed comes with a ten year anti rot guarantee. Now this is a very generous guarantee, but you must remember to still treat the shed each year. 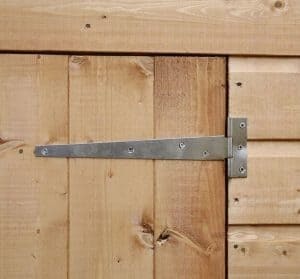 Getting things in and out of a shed should never be too much of a hassle and here we have a good sized door to make things easy. At 2 feet 5 inches wide, you should not have any major problems getting larger things inside. The actual design of the door is something we really like. It is very sturdy and with its strong hinges will always stay in place. To keep the door closed it comes with a pad bolt. One thing that is great about this shed is how when you are building it, you can decide where on the front the door goes. It can be placed in one of three sections on the shed. This is ideal as it means you can have the door in a location that is convenient for you. There is one window on the 10′ x 6′ Windsor All-Purpose Pent Shed and it lets in a decent amount of natural light and is made with styrene. It is actually a rather large window and it does give the shed a little extra personality which we really like. 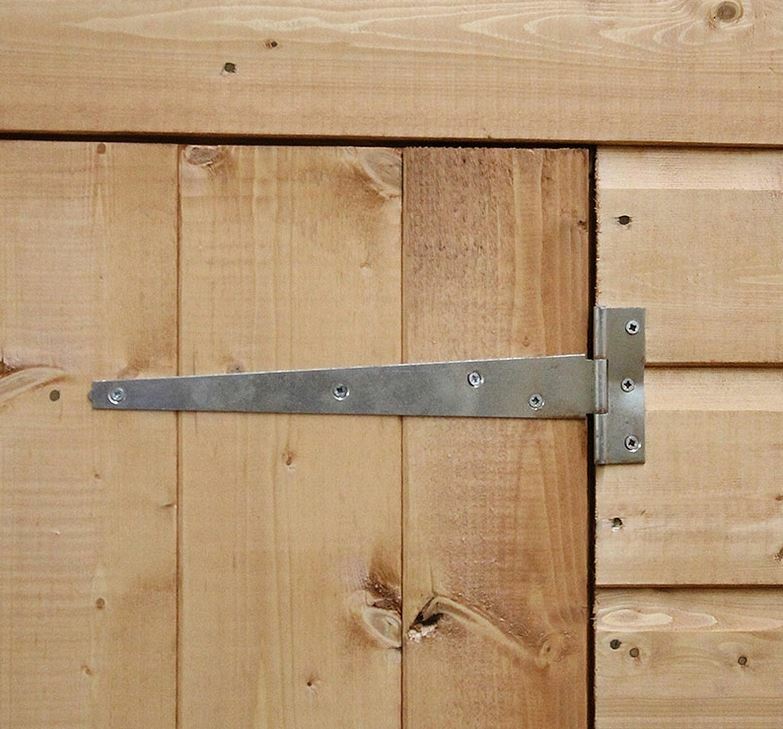 You have a pretty strong shed on your hands here and that pad bolt will keep the door securely shut. 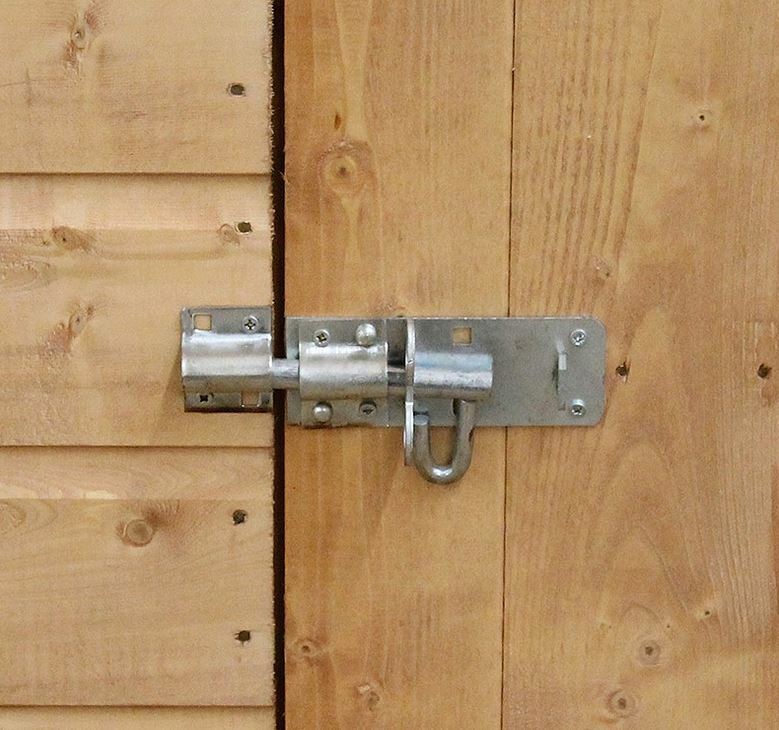 However if you do want to keep things more secure then adding a padlock is something that is easy and very cheap to do. Of course that lovely large window does allow people to be able to look inside and see what you have, but with a curtain or even just some kind of fabric, you can jazz up the front of the shed and give yourself a little bit more privacy should you want it. To give the shed your own personal style then you can achieve this by picking a wood treatment that is a colour you love. We are amazed at just how many different colours of treatment are out there and are sure there will be one that fits your style perfectly. 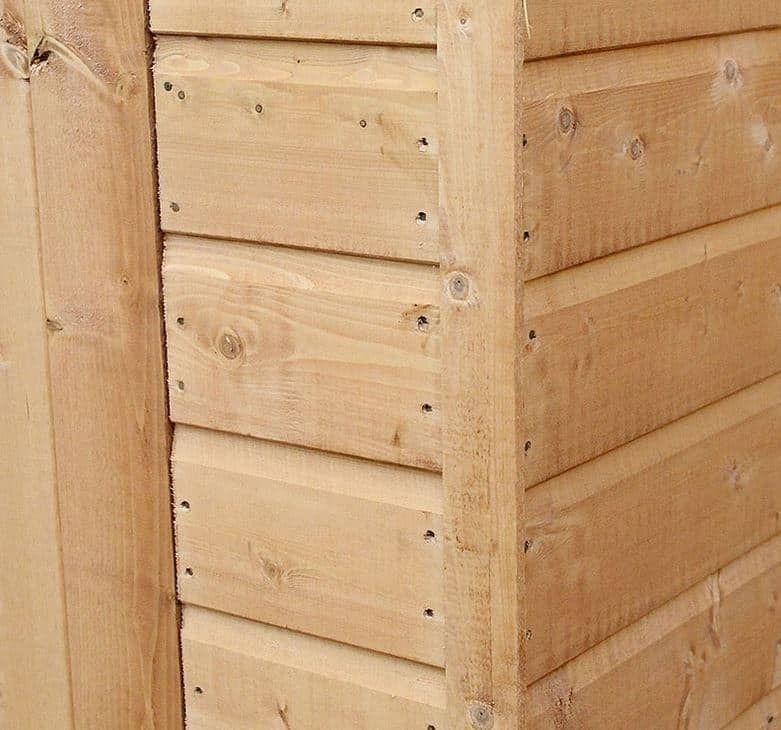 There is a Timber Base Kit that you can buy at a cost of £109.99 if you are a bit worried about the ground you will be placing the shed on, but to be honest as long as the ground is solid and flat, you should be fine. A padlock we feel is always an extra worth buying as it allows you to keep things locked up and it is also very cheap. 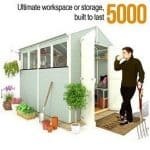 For under £500, you really are getting a shed that is great quality. We are actually quite amazed that Windsor have been able to use such good materials at this price range. This is the type of shed which if you look after it right will provide you with many years of use. The storage space that you get here for the money you will be spending we feel is just incredible. This is not the hardest shed to build in the word, but it is still a two person job. A job that is made all the easier and less stressful with a flask of good coffee and a tub of biscuits, better make that two tubs of biscuits actually. Just follow what the instructions tell you, take your time and we are sure everything will work out fine. Windsor really have made an impressive shed here that offers an amazing amount of storage, but is also made very well. We really do think this offers incredible value for money. Final Thoughts: When we think about the 10' x 6' Windsor All-Purpose Pent Shed. The first thing that pops into mind is how incredibly cheap this shed is, but that is actually doing it a huge disservice. Yes this is one fantastic price, but there is so much more to this than the low price tag. To start with it looks lovely with its modern pent roof design. The storage space it provides you with is just ideal and it also is going to last you for many years thanks to the materials that have been used. 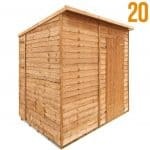 In all this is one of the best low priced, large sized sheds we have seen in quite some time.